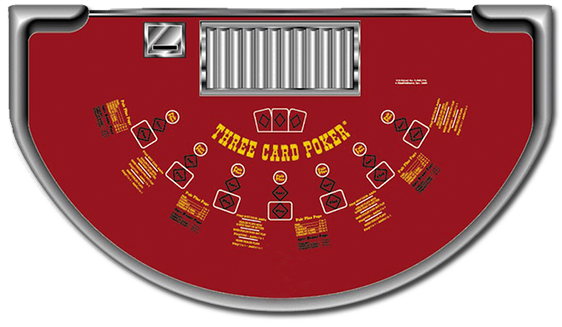 The Three Card Poker is an entertaining card game involving two independent bets: the Pair Plus bet and the Ante and Play bet. The player can choose to place a wager on either of them or even both of them before the dealer hands out the playing cards. The cards are dealt from a standard 52 card deck. The hands are ranked in a descending order, starting with Straight Flush as the highest value, then continuing with Three of a Kind, Flush, Pair and Nothing. You can see the Hand Ranking table for additional information. Both the player and the dealer are dealt three cards to their hand. Pair Plus - In the Pair Plus bet, everything that matters is the hand rank of the player’s hand. The dealer’s hand is out of the equation and has no impact on the game. The player wins the bet if he has a Pair or a better rank. The bet is lost if the player has Nothing at his hand. If the player holds a Straight or better (Three of A Kind or Straight Flush), a bonus is paid. The bonus is tied to the Ante bet. In such a case, the dealer’s hand or whether the player wins or loses does not matter. Learn how to play Roulette and maximize your chances of winning with this easy tutorial!